Amachi has been with us over 2 years!! She brings us great joy and laughter everyday! 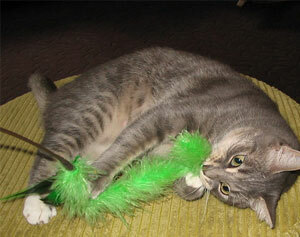 Amachi took her time warming to us and her new home…but she now runs the house with confidence. 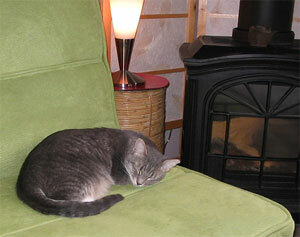 Not long after we brought Amachi home, Garcie, an outdoor kitty belonging to the neighbors, decided to move here. There was no persuading Garcie to go back home. We have transitioned her to a mostly indoor cat. Amachi tries to be welcoming, but she has trouble dealing with her feelings maturely and thus, chases Garcie every chance she gets. Garcie claimed the bedroom and Amachi happily has the rest of the house. It seems to work out. Amachi has the usual cat hobbies. She likes to watch the birds and squirrels, chase and eat unlucky spiders, play with a variety of toys, purr, and eat (while being petted). She enjoys any kind of organizational task that takes us to the dark and unexplored corners of the house. She has been allowed in the attic briefly, but I know that a serious, attic exploration is on her list of things to do for 2009. She gets an occasional romp outside with a harness on a sunny day. Greg refers to Amachi and me as two-peas-in-a-pod. If you find one of us, the other is not far away!!! Thank you again for this wonderful kitty and thank you for all the work you do.